Important informations to know and a hiking map – Take a look! cave in the Northern Limestone Alps of Austria. 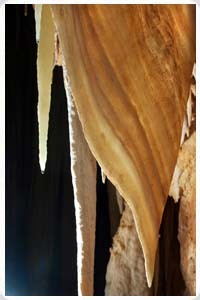 The show cave is situated in the mountain "Gasselkogel", a mountain east of Traunsee . It is accessible via forest roads and different hiking paths. The main track starts at the village of Rindbach (near Ebensee, Upper Austria) and follows a small river with picturesque cascades. After passing by the wooded valley of "Rindbachtal" and the mountain pasture "Lichteneckalm", the hiker will reach a managed mountain hut next to the cave entrance (EL 1229 m/ 4032 ft.). 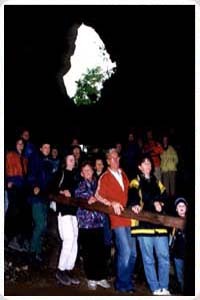 The hike to the chalet and the show cave takes about 2 1/2 hours and is also recommended for families. The Gasselhöhle was discovered in 1918 and became quite early a tourist attraction of the Salzkammergut. In 1931 the cave was nominated as a protected natural monument by the Austrian government. The official opening of the show cave took place in 1933. Not far inside the cave the explorers found several skeletons and single bones of the cave bear, which is an extinct species today. journey leads the visitors along concreted paths and wooden stairs approximately 250m (820ft.) inside the cave. Inside the chalet and on the sun terrace with a panoramic view on the surrounding Alps the hut keeper offers regional delicacies, like the unique "Zirbenschnaps", a liqueur made of pine cones, and the "Kaiserschmarrn". The opening hours of the mountain hut are the same as of the show cave. 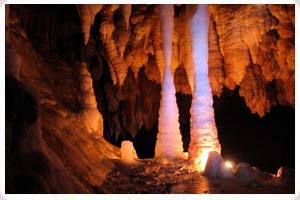 The temperature inside the cave ranges from 6 to 7°C (42-44°F) and the relative humidity of the air reaches nearly 100%. In these conditions the air is almost sterile. The cave is nominated as a favourable place for the treatment of asthma and allergies. 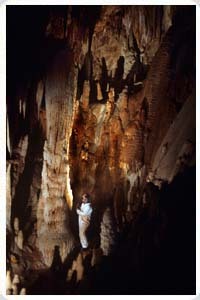 Nowadays the cave system "Gasselhöhle" is surveyed 5 kilometres in length (3mi.) and 150m (500ft.) in level difference. 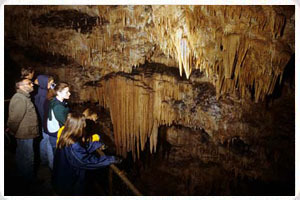 In 1984 the discovery of the "Hall of the Pearls" caused a sensation in the Austrian speleological society. 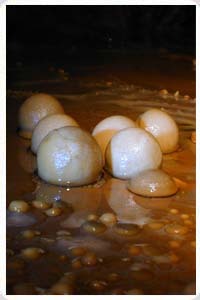 There, the explorers have found several cave pearls, which are the biggest in Austria, up to 4cm (1½ in.) in diameter. During the current explorations (since 2006) new parts of the cave (like the "Sintervulkanhalle") were discovered, which are not open to the public. In 2010 the survey group of the Speleological Society of Ebensee was highly distinguished by winning the "Poldi-Fuhrich-Price" of the Austrian Speleological Association. 15-20 minutes. Other hiking paths lead you from Rindbach via the Spitzlsteinalm to the show cave. Find the GPS coordinates for the different hiking paths on our website. society. Furthermore the club is engaged in the exploration, survey, documentation and scientific research of caves in cooperation with specialist institutions. The Club is open to everybody, who is interested in caves and mountaineering. For an annual membership fee of only 18 Euro, several benefits are included like a non-work-related accident-insurance up to 40.000 Euros for outdoor activities as climbing, mountaineering, caving, skiing etc. The insurance also includes the rescue costs like a helicopter transport in case of an emergency. The insurance is valid worldwide. 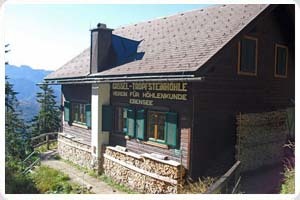 As a member Speleological Society of Ebensee you also profit of all the benefits of the Austrian Alpine Association like the reduced accommodation costs in all alpine huts in Austria, managed by the Austrian Alpine Club (ÖAV), die Naturfreunde, der Österreichischer Touristenklub (ÖTK), Bergsteigervereinigung and the Austrian Speleological Association. 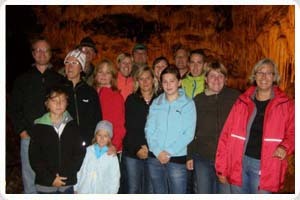 Every member of the club has free access to the guided cave tours to the Gasselhöhle during the opening hours. If you are interested just contact us or fill out the requested membership form. Drive from Ebensee (Upper Austria) to Rindbach. Free parking area at the end of the public road. The hike takes 2 1/2 hours along a marked path. Beginning of May to mid-September. Last tour starts at 4:00pm. Take warm clothes with you! Free for children less than 6 years old! Advance reservation necessary! Bus service only on request! * Adults, who have booked an ascent and descent by bus, pay only 6 € for cave admission. The route from Rindbach via forest roads to the Karbertalalm is open for mountain bikers. 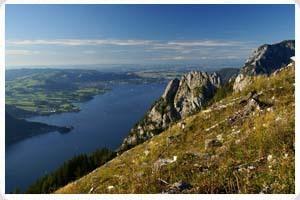 It is also connected to the mountain bike-route "Rindbach - Farnau - Offensee".